There is a certain "star" that does not twinkle. It appears suddenly over the southern hemisphere, a new neighbour in the crowded black sky, but it is not a natural star. It is called a Laser Guide Star, or LGS - a device that helps scientists to get a better picture of real stars or other objects in the sky. 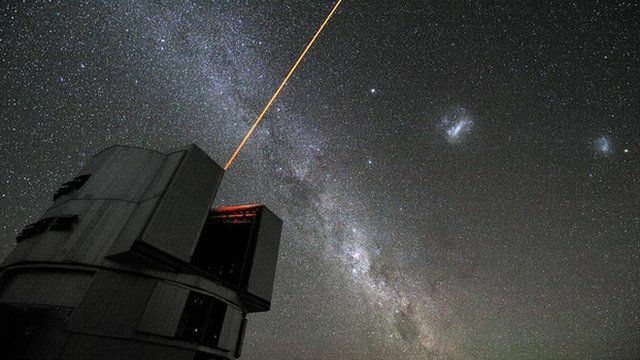 Frederic Gonte, head of instrumentation at Paranal, and astrophysicist Domenico Bonaccini Calia, head of the Laser Guide Star group at ESO, tell us about the current laser and the new unit. Produced by BBC technology reporter Katia Moskvitch, who was on secondment to ESO for two months leading up to her trip to Chile.